At the beginning of 2016, Morocco faced its first influenza outbreaks in commercial poultry farms caused by avian influenza virus (AIV) H9N2. The disease spread to all types of poultry productions in different areas of the country within few weeks, causing very sharp drop in egg production of up to 75 % in layers and breeders, and high morbidity and mortality in broilers and turkeys of up to 60 % and 30 % respectively due to a very severe respiratory disease. The aim of this study was to evaluate the efficacy of GALLIMUNE 208 vaccine in turkey poults against challenge with the Moroccan AIV H9N2 strain. GALLIMUNE 208 is a bivalent ND & H9N2 inactivated vaccine based upon a Middle-East H9N2 strain. 80, day old turkeys were divided into 4 groups of 20 poults each: vaccinated and challenged group, (VC), vaccinated and unchallenged group, (VNC), unvaccinated and challenged group, (NVC) and unvaccinated and unchallenged group (NVNC). The vaccinated groups received at 8 days of age, 0.3ml of Gallimune 208 vaccine by subcutaneous injection. At 26 day of age, the challenged birds received 0,2ml of Moroccan AIV H9N2 at 107 EID 50/ml by via oculo-nasal route. All turkeys were observed daily for clinical signs, respiratory rales according to a scoring model: 0=no rales, 1=mild, 2=intermediate, 3=severe, and other clinical signs attributable to H9N2 for 15 days post challenge. Ten (10) turkeys from groups VC, VNC and NVC were euthanized at 5 and 10 days post-challenge. Clinical signs and gross lesions were evaluated in the birds. Oral and cloacal swabs at 3, 5, 7, 9 and 11 days post-challenge were collected. The protection was assessed by a reduction of clinical signs and virus persistence and shedding. The results showed that vaccinated birds developed fewer clinical signs and recovered more rapidly in comparison with unvaccinated birds that developed severe respiratory signs. The RT-PCR results showed that vaccination delayed the virus detection in the respiratory tract in 50% of birds on day 3. 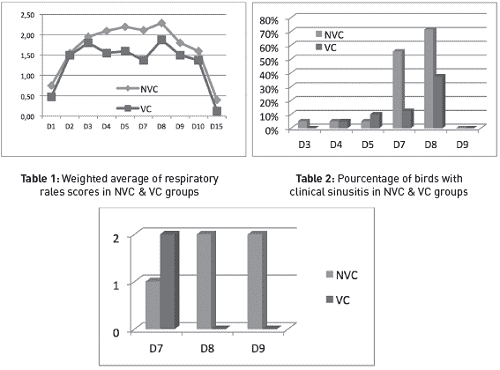 Vaccinated birds showed less intensity and duration of viral detection in the respiratory tract and cloacal swabs in comparison with the unvaccinated birds. Vaccination with Gallimune 208 ND+FLU H9 ME had a positive impact on the protection of turkeys by reducing the duration, the intensity of clinical signs, the mortality rate and the virus persistence and shedding. In the field, in order to control effects of H9N2 affections, vaccination has to be supported by a high level of biosecurity, good rearing conditions and proper management of concomitant viral and bacterial diseases. Institut Agronomique et Vétérinaire HASSAN II, Rabat, Morocco ; 3Boehringer Ingelheim AH, Lyon, France.